Lex Luthor, in all his malevolent glory! Exquisitely detailed limited edition 1:10 scale statue. Based on the concept art of Ivan Reis of Chiaroscuro Studios. Superman won't appreciate what the supervillain has in his hand! 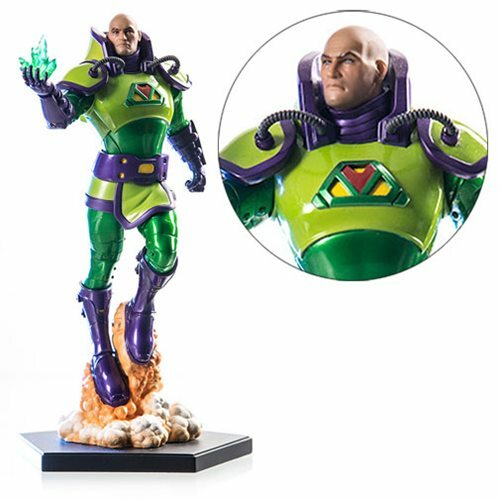 Based on the concept art of Ivan Reis of Chiaroscuro Studios, and crafted in polystone, this hand-painted DC Comics Lex Luthor 1:10 Scale Statue is an exquisitely detailed limited edition that presents the DC supervillain in all his malevolent glory, complete with Superman's nemesis, kryptonite, in his hand. The sensational statue stands 9 2/5-inches tall on an amazing base. Ages 15 and up.